Contactor merupakan komponen listrik yang berfungsi untuk menyambungkan atau memutuskan arus listrik AC. Contactor atau sering juga disebut dengan istilah relay contactor dapat kita temui pada panel kontrol listrik. Pada panel listrik contactor sering digunakan sebagai selektor atau saklar transfer dan interlock pada sistem ATS. Berikut adalah bentuk contactor yang dapat kita temui. Prinsip kerja contactor sama seperti relay, dalam contactor terdapat beberapa saklar yang dikendalikan secara elektromagnetik. Pada suatu contactor terdapat beberpa saklar dengan jenis NO (Normaly Open) dan NC (Normaly Close) dan sebuah kumparan atau coil elektromagnetik untuk mengendalikan saklar tersebut. Apabila coil elektromagnetik contactor diberikan sumber tegangan listrik AC maka saklar pada contactor akan terhubung, atau berubah kondisinya, yang semula FF menjadi ON dan sebaliknya yang awalnya ON menjadi OFF. Untuk memahami prinsip kerja contactor dapat dilihat dari gambar skema contactor berikut. 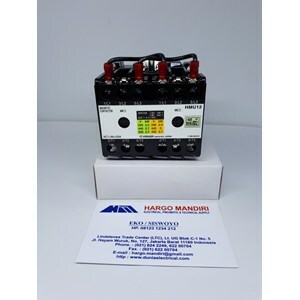 JUAL MAGNETIC CONTACTOR HMUF 12 KASUGA. DUNIAELECTRICAL.COM: Toko Listrik di Glodok Jual Produk Magnetic Contactor Murah seperti: Magnetic Contactor Kasuga HMUF 12, Contactor hmuf 18 kasuga, CONTACTOR SCHNEIDER: Contactor Schneider LC1D09M7, Schneider Contactor LC1D12M7, Contactor Schneider LC1D18M7, Contactor LC1D25M7 Schneider, Contactor LC1D32M7 Schneider electric, Schneider Electric Contactor LC1D38M7. Overload Relay Schneider: LRD01 SCHNEIDER ELECTRIC, Overload Relay LRD02 Schneider, Overload Schneider LRD 03, Thermal Overload Relay LRD 04, LRD 05 Overload Relay Schneider electric. Magnetic Contactor Mitsubishi, Contactor SN 35, Magnetic Contactor ST 10, Contactor ST 20, Mitsubishi Contactor SN 150, Contactor Teco, Contactor CU11, Teco Cu 16, Magnetic Contactor CU18, Contactor LS: Contactor MC-9b, Magnetic Contactor MC- 12b, Contactor MC-18b, Contactor MC- 22b, Magnetic Contactor MC-32a LS, magnetic Contactor MC-50a LS, MAGNETIC Contactor MC- 100a LS. Magnetic Contactor Fuji: magnetic contactor sc-03 fuji, fuji electric Contactor sc-0, Magnetic Contactor SC-05 Fuji Electric, Fuji Contactor SC-N1, Contactor Fuji SC-N2, SC-N2S Contactor, Contactor SC-N3, Magnetic Contactor SC-N4 Fuji Electric, Fuji Contactor SC-N5, Magnetic Contactor SC-N6, Contactor SC-N7 Fuji, Fuji Contactor SC-N8, Magnetic Contactor SC-N10. Thermal Overload Relay TR-0N/3 Fuji Electric, Thermal Overload Relay TR-5-1N/3. Thermal Overload Relay TR-N2/3 Fuji Electric, Overload Relay TR-N3/3 Fuji. Thermal Overload Relay TR-N5/3 Fuji Electric . Contactor Siemens, Contactor Togami. Temperature Fuji, Temperatur Hanyoung, Temperature Controller Fotek. Temperature Shinko, Temperatur Kontrol RKC, Temperatur Shimaden. Temperature Omron, Temperature Honeywell, Temperature Controller Azbil / Yamatake. Temperatur Kontrol Chino, Temperature Controller Yokogawa. Magnetic Contactor, Thermal Overload Relay, Auto Breaker / MCCB, MCB, Circuit Protector. Inverter, PLC ( Program Logic Controller ) dan Program Controller Melsec. Relay, Timer, Counter, Counter / Timer. Kabel NYY, NYA, NYM dari Merek 4 Besar. Sensor Kabel, Proximity Switch, Photo Sensor, Photoelectric. Adapun Merek- Merek yang Kami Sediakan seperti : ABB, Fuji Electric, Mitsubishi. Autonics, Hanyoung, Fotek. Teco, Siemens, LS, Chint, Schneider Electric. Azbil / Yamatake, Honeywell, Sick. KASUGA : Magnetic Contactor HMU18 2 Kasuga, Contactor Kasuga HMUF20, Magnetic Contactor Kasuga HMUF12. Magnetic Contactor LS : Contactor MC-9b LS, LS Magnetic Contactor MC- 12b, MC-11a LS, Contactor LS MC-18b, Contactor MC- 22b LS, Magnetic Contactor MC-32a LS, magnetic Contactor MC-50a LS, Magnetic Contactor MC-40a LS, Magnetic Contactor MC-85a LS, MAGNETIC Contactor MC- 100a LS. MCCB ABS 103c LS, Circuit Breaker ABN 103 c LS, Breaker LS ABN 403c. Circuit Breaker ABS-53c LS. Inverter SV008i65A- 4 LS, Inverter SV040iG5A-4 LS, inverter ls SV0022IG5A-4 ls, Motor Stater MMS- 32 S LS. Magnetic Contactor Teco & Thermal Overload Relay Teco : Magnetic Contactor CU11, Teco Cu 16 Contactor, Magnetic Contactor CU18 Teco, Magnetic Contactor CU-27 Teco, Kontaktor CU-50 Teco, Teco CU-65 Contactor, Teco Magnetic Contactor CU-80. CONTACTOR SCHNEIDER ELECTRIC : CONTACTOR SCHNEIDER: Contactor Schneider LC1D09M7, Contactor LC1D09F7 Schneider Electric, Schneider Contactor LC1D12M7, Schneider Contactor LC1D18F7, Contactor Schneider LC1D18M7, Contactor LC1D25M7 Schneider, Contactor LC1D25F7 Schneider Electric, Contactor LC1D32M7 Schneider electric, Contactor LC1D32F7 Schneider Electric, Schneider Electric Contactor LC1D38M7. LC1D38F7 Contactor. Schneider LC1D40AM7 contactor, Contactor LC1D50A Schneider Electric, Contactor Schneider LC1D65A, Schneider Contactor LC1D80, Contactor LC1D95 Schneider Electric, Contactor LC1D115 schneider Electric, Contactor Schneider LC1D150. Magnetic Contactor Fuji Electric : Magnetic Contactor SC-N4 Fuji Electric, Fuji Kontaktor SK12L, Contactor SC-N10 Fuji Electric, Magnetic Contactor SC-03 Fuji Electric, Magnetic Contactor SC-N2 Fuji, Contactor SC-N2S Fuji, contactor SC-N1 Fuji, Fuji Contactor sc-n6, contactor SRC-3631-2 fuji, Magnetic Contactor SC-0 Fuji, Contactor SC-05 Fuji, Contactor SC-5-1 fuji Electric, Magneti Contactor SC-4-0 Fuji, Magnetic Switch FJ B12WP Fuji Electric, Magnetic Contactor SH-4 Fuji, Kontaktor SC-N3 Fuji, Magnetic Contactor SC-1N Fuji Electric, Contactor SRC-3631-5-1 Fuji, Contactor SJ-06G Fuji, Solid State Contactor SS203-1, Fuji Contactor SC-N4, Kontaktor Listrik SC-02 Fuji, Magnetic Contactor SRC-3939-06M Fuji Electric, Contactor SRC50- 2UX. Thermal Overload Relay TR-N73 Fuji Electric, Overload Relay TR-ON3 Fuji, Overload Relay TR-N2 3 Fuji.